On Tuesday morning during a hearing Tyga feigned sickness when the lawyer for a jeweler started asking him questions about how much loot he shells out for GF Kylie Jenner. Celeb jeweler Jason of Beverly Hills ﻿hauled Tyga into a hearing to determine if he has enough money to satisfy a $200k judgment for a fancy chain and timepiece. Tyga, who flipped off our photog and aimed a pretend gun at him on the way in, was pretty accommodating, telling Jason's lawyer, Boris Treyzon, about his income and what he owns. 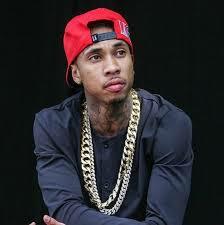 But then Treyzon started grilling Tyga about various gifts he's given Kylie, and that triggered a 911-type emergency. We're told Tyga said he started feeling extremely ill, lost memory and became confused, telling the lawyer he just couldn't go on. The tricky part ... Kylie has cooed openly on social media about various gifts she's received from her BF, including a Mercedes as a birthday present. If he can afford that, he can afford to pay Jason. But, if Tyga says he didn't give Kylie all that stuff, he's effectively saying she's a social media liar. The hearing's been rescheduled for November 1st ..the same day Kylie's set to come in for a separate interview.